All radiation from the sun, whether it is PAR light, UV or infrared, has an effect on the growth and production of crops. You can selectively manage it with coatings that increase the positive effects and inhibit the negative ones. Continue reading What does light do to your crop? 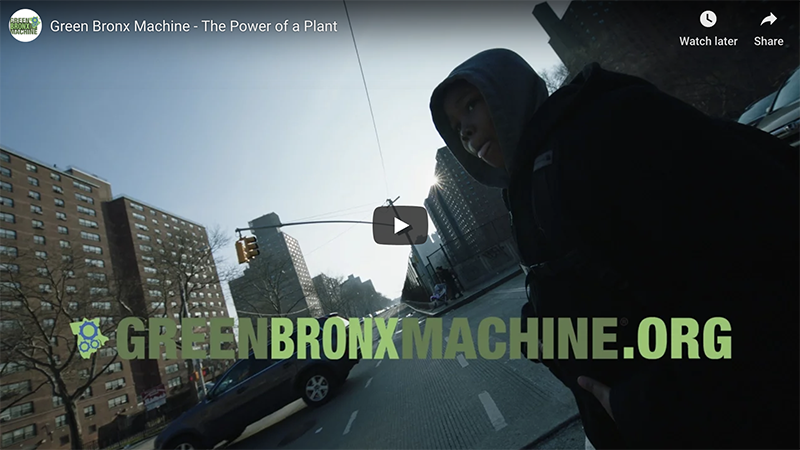 Press Release – NEW YORK – Green Bronx Machine (GBM), a nationally recognized non-profit organization dedicated to helping students live happier and healthier lives, is partnering with Empire BlueCross BlueShield (Empire) to launch the first wheelchair accessible farm and teaching kitchen in America at P.S. 721x, a District 75 school in the Bronx dedicated to educating students living with disabilities. Continue reading Do you want to sell the freshest, most flavorful and fragrant cut basil? Topclear: for a spotlessly clean greenhouse roof! 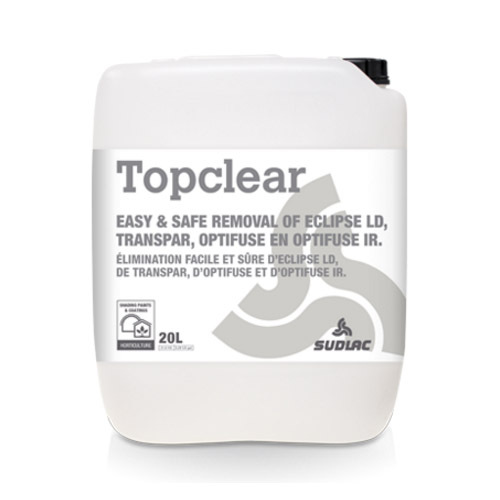 Topclear is the perfect cleaner for removing Sudlac Eclipse® LD, Transpar®, Optifuse® and Optifuse® IR coatings. With this product, the grower decides when to remove the coating. Simply spray on Topclear, leave it to wash off in the rain, and you’ll have a clean greenhouse roof that allows maximum light into the greenhouse. This is particularly important in the fall and winter to ensure optimum growth, quality and fruit setting. Continue reading Topclear: for a spotlessly clean greenhouse roof! Getting the crops to continuously grow well is the biggest challenge during the extreme summer heat in Ontario. Transpar makes the greenhouse climate at Howard Huy Farms, Leamington, somewhat milder. What are the benefits of applying greenhouse shading products? Sudlac shading products give greenhouse growers of flowers and vegetables the ability to increase and extend production during periods of warm temperatures and high light levels. High temperatures and high light levels, especially during the summer can have negative effects on ornamental and vegetable crops produced in protected structures, including greenhouses. An economical way for growers to reduce light and temperature levels is by applying shading products to greenhouse glazing materials. Continue reading What are the benefits of applying greenhouse shading products? Incorporating dissolved oxygen into hydroponic production systems during warmer temperatures can help improve plant growth and reduce crop time. Trying to grow hydroponic crops like leafy greens can be a real challenge during warmer times of the year. Growers have few options to lower temperatures, including cooling the greenhouse and/or water temperature. Another production technique that is being used by hydroponic growers in the United States and Australia is to introduce dissolved oxygen into the fertilizer tank solution. “We’ve heard anecdotal reports that increasing dissolved oxygen levels can help prevent some root diseases like Pythium and other root rots,” said Tyler Baras, special projects manager at Hort Americas in Bedford, Texas. “We’ve also heard that increasing dissolved oxygen can possibly improve nutrient uptake and improve overall growth. Another possible benefit with using dissolved oxygen is reducing tip burn on leafy greens. 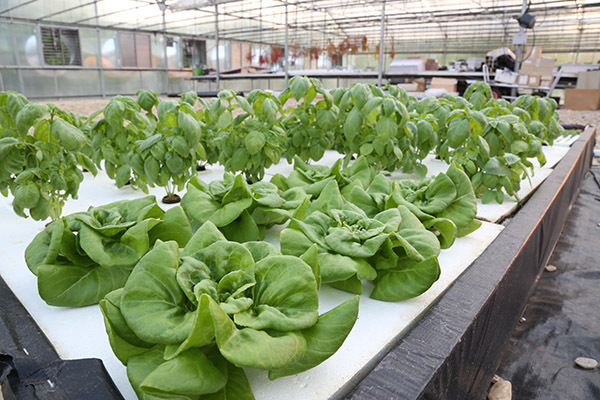 Hort Americas conducted trials growing butterhead lettuce, basil and arugula in deep water culture systems at three different levels of dissolved oxygen. The optimum water temperature for lettuce is between 65ºF-70ºF. For basil the optimum water temperature is around 75ºF. Baras said most of the references he has read for adding dissolved oxygen suggest incorporating 4-10 parts per million for leafy greens. 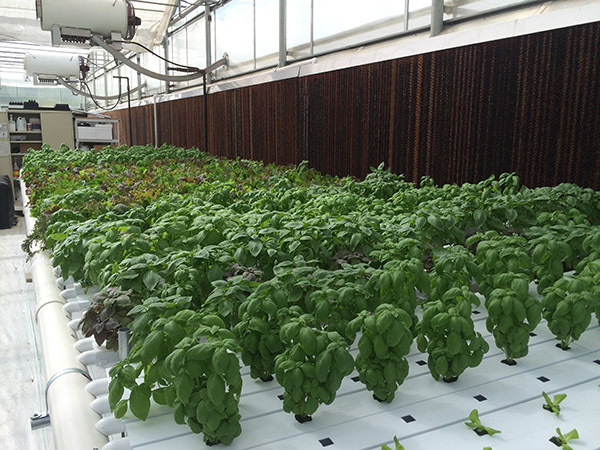 Baras has been studying the impact different dissolved oxygen levels can have on butterhead lettuce, basil and arugula grown in deep water culture systems. He set up deep water culture systems with three different levels of dissolved oxygen: 2 ppm, 7.5 ppm and 29 ppm. In another system Baras used a Venturi attachment to a small submersible pump that drew in atmospheric air. The third system is a high rate of dissolved oxygen that uses compressed oxygen tanks to deliver 29 ppm. “This system uses nanobubble technology,” he said. “We were using a prototype device that forces oxygen into a solution in really small bubbles so that the oxygen stays in suspension longer instead of falling out. The lowest rate that we could set was 29 ppm. This level of dissolved oxygen is much higher than what most leafy greens growers are targeting. Baras said he has seen some dramatic effects on plant growth with higher dissolved oxygen rates. At the beginning of the trials during the first month the water temperature in the fertilizer tanks was 80ºF. During the second month the water temperature was between 75ºF-80ºF. Baras said even at the low rate of 2 ppm some crops could still be marketable. “The basil and butterhead lettuce could still pass as marketable at the low 2 ppm rate,” he said. “The plants were very small and it would take several more weeks of production to reach the target weights we were aiming for. At the 7.5 ppm dissolved oxygen rate the plants had fairly normal growth as to what we are used to seeing. For butterhead lettuce at the 2 ppm rate the heads were smaller and compact. The core of the heads were tighter, but actually had a good shape. At the 7.5 ppm and 29 ppm rates, the heads had similar shapes. Butterhead lettuce (left to right) grown in 29 ppm, 7.5 ppm and 2 ppm of dissolved oxygen. For the basil there was an increase in height as the dissolved oxygen level increased. Overall the plant height and size increased at higher dissolved oxygen rates. Baras said the roots for the crops in the three rates of dissolved oxygen had different growth patterns. At the 7.5 ppm dissolved oxygen rate the roots were long and had a lot of lateral branching. Baras said they looked like standard hydroponic roots. Arugula (left to right) grown in 29 ppm, 7.5 ppm and 2 ppm of dissolved oxygen. Even though there were differences in the root morphology, there was no significant difference in the root weight for all three dissolved oxygen levels. The average root weight for both the 7.5 ppm and 29 ppm rates was 0.8 ounces. The root weight for the 2 ppm rate was about 0.7 ounces. 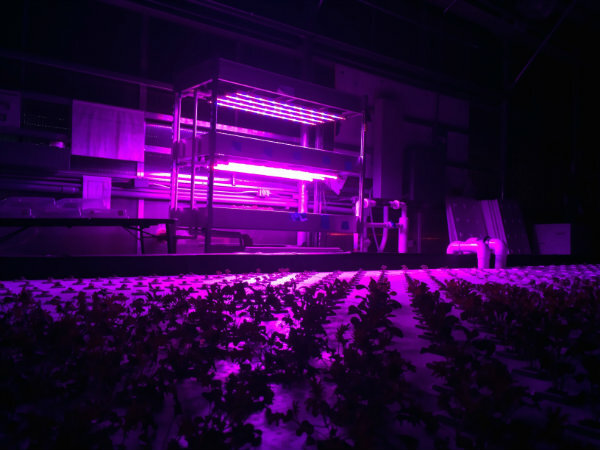 How quickly hydroponically-grown lettuce and leafy greens seedlings are transplanted and their exposure to LED light during propagation can impact crop production times. 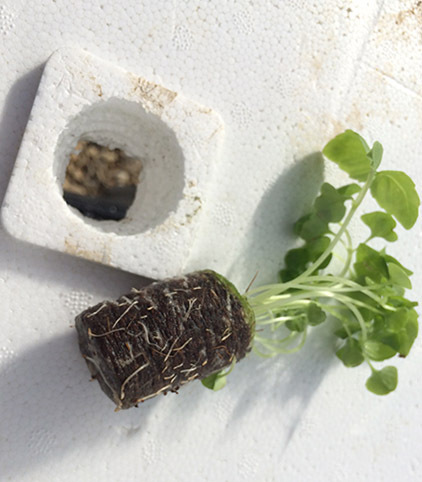 Most growers using traditional hydroponic substrates transplant lettuce and leafy greens seedlings as soon as the roots reach the bottom of the plugs. This usually takes from seven to 10 days. Bell peppers grown in greenhouse hydroponic systems follow similar environmental requirements as tomatoes and eggplants. It is a common production practice to leave all the leaves on the pepper plants. This creates very tall walls of foliage that slightly affect the plants’ nutritional requirements. Pepper growth follows generally two different phases during greenhouse production. After the seedlings are transplanted, the first six weeks of production is geared toward developing a strong vegetative base. After fruit set, the nutrient recipe is changed slightly to keep the plants in balance. For peppers only potassium is significantly increased after fruit set occurs. Table 1. Nutrient solution for hydroponic pepper cultivation. Concentrations in parts per million (ppm) at the dripper. Micronutrients are in shaded boxes. (*) See below for explanation on blossom end rot. Like all nutrient recipes the numbers in Table 1 are a starting point that will need to be adjusted depending on the local environment (temperature, humidity, solar radiation and water quality) and the different salt accumulations that occur in normal conditions depending on the absorption by any given strain of pepper. Note that the ammonium (NH4) levels for young and mature plants are very low compared to nitrates. Ammonium is not necessary depending on the substrate included for pH buffering. Note also that chloride and sodium have upper ranges. These two are considered contaminants even if they have nutritional value for the plants. They are generally present in the water and their requirements are very low similar to micronutrients. Bell peppers’ most common physiological problem is blossom end rot, which is generally due to a water stress preventing the internal transport of calcium. It is common to increase the concentration of calcium ions in the solution together with chloride, phosphate and boron while reducing potassium to promote the absorption of calcium during potential blossom end rot periods, particularly during hot summers (* in Table 1). Commonly in hydroponic production, chemicals are mixed in concentrated solutions to be diluted at the time of irrigation. The drawback of this fertilization method is that some of the chemicals present will precipitate out and be removed from the nutrient solution and need to be kept separate in at least two reservoirs. As a common rule, calcium needs to be separated from phosphates and sulfates to prevent precipitation. Sudlac is coming to North America in 2017. The company’s goal is to become the leading manufacturer of shading materials for the global greenhouse horticulture market. This is apparent from the complete restyling of the company brand all the way to the development of its fast-growing team. Behind the scenes, every team member is working hard to build a solid, full-coverage distribution network. Sudlac’s target group is a large segment in the shading market including growers who choose no-nonsense, reliable, high quality shading products. Sudlac is serving this market with a wide range of products from powder in bags to high tech removable coatings in buckets. Sudlac’s updated approach is practical and service-driven. 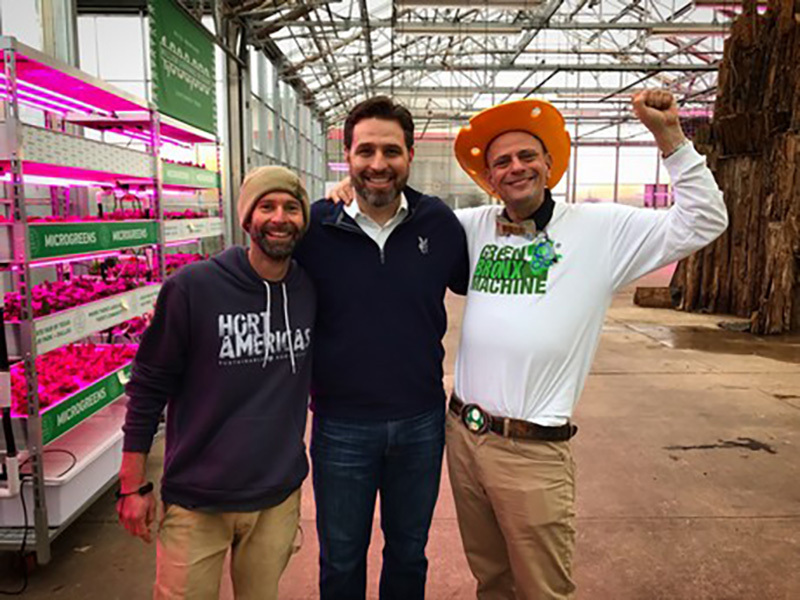 Last year, the company opened a dedicated sales office in Purmerend, Netherlands, which is close to the international Schiphol Airport and the country’s greenhouse cultivation zone. This enables Sudlac to provide excellent support and service in the Netherlands and worldwide. A well-trained network of distributors supports product deliveries. There are still opportunities for new distribution partners who want to be part of this positive development. “Throughout the years, we have gained extensive experience, developing our products such that a distributor can include them in their product selection with full confidence,” says Plak-Schouten. Sudlac also provides support for product application by utilizing the knowledge and experience of Dutch contract applicators, which can be shared with growers worldwide. These applicators can advise from their practical perspective, sharing the best and most professional application methods with growers. Sudlac’s website, packaging, brochures and newsletters are vibrant and informative. The product wizard on the new website assists growers step-by-step in selecting the most appropriate product for the relevant crop, location and greenhouse type. The company’s monthly newsletter highlights interesting information related to products as well as practical experiences. Sudlac’s new style will be presented officially during various horticultural trade shows in January and February 2017. Trade show visitors can experience the fresh new look and be introduced to the company’s extensive sales team. Eclipse® LD is a removable white shading paint for greenhouses. It protects crops against too much light and heat throughout the season and can be applied on the outside of all standard greenhouses. Eclipse LD needs to be mixed with water and can be applied in many situations, making it a basic yet all-round product for horticulture use worldwide. Eclipse LD is highly wear-resistant and easily removed with Topclear at the end of the season. The Eclipse LD shade layer reduces stress and prevents crops and fruits from sunburn, improving production and quality. In countries with a moderate climate, Eclipse LD is mainly used for protecting ornamentals and leaf vegetables in greenhouses. In warmer areas of the world, Eclipse LD is also used for fruit vegetables like tomatoes and sweet peppers. Eclipse LD is a very efficient and versatile shading agent that reduces the light and temperature in the same ratio. This shading product is flexible in use because you can adjust the number of buckets, amount of spray solution and application method. Eclipse LD is easy to apply and to remove. Eclipse LD needs to be diluted with water before spraying it onto the greenhouse. Depending on the application method, type of greenhouse and climate, the dilution rate and amount of spray liquid can vary to achieve the best results. Eclipse LD can be applied manually, by machine and by helicopter. See how to use for more detailed information about applications and dosage. Eclipse LD can be removed with Topclear whenever necessary. Apply Topclear in the advised amount and dilution. Read the complete instructions on how to use Topclear. Transpar® is a removable shading agent based on a special pigment that reflects heat radiation very efficiently, while maintaining high photosynthetic light levels. Transpar diffuses incoming light which is beneficial in optimizing the greenhouse climate. It is very wear-resistant and can be applied on the outside of all standard greenhouses. Transpar is easily removed with Topclear at the end of the production season. High solar radiation means high photosynthetic light levels for photosynthesis. However, it also generates heat radiation which can be stressful to crops. 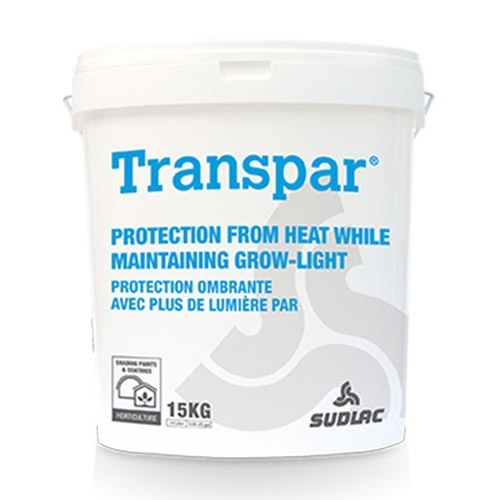 Compared to traditional whitewash coatings, Transpar ensures a higher photosynthetically active radiation (PAR) while the heat radiation (NIR) is partly reflected. Higher PAR results in more photosynthesis. Photosynthesis is the process where the plant energy from the sunlight transfers into sugars. These sugars are the building blocks for plant growth, fruit production and flower quality. Heat radiation is not used by the crop for photosynthesis. This radiation heats the greenhouse and the crops leading to plant stress. By reducing the heat radiation in the greenhouse, plant temperature is more moderate, resulting in better quality plants and higher production. In addition to increased PAR transmission, Transpar has great diffusing properties. This improves the greenhouse climate, resulting in positive effects on the quality and production of the crop. Transpar needs to be diluted with water before application to the greenhouse. Depending on the application method, type of greenhouse and climate, more or less water and buckets should be used to achieve the best results. Transpar can be applied manually, by machine and by helicopter. See how to use for more detailed information about applications and dosage. Transpar can be removed with Topclear whenever necessary. Apply Topclear in the advised amount and dilution. Read the complete instructions on how to use Topclear. Optifuse® IR is a removable greenhouse coating that scatters the light to a high degree in combination with effective heat protection. Optifuse IR is very wear-resistant and can be applied on the outside of all standard greenhouses. Optifuse IR is easily removed with Topclear at the end of the season. Optifuse IR offers a very high level of diffusion and a high light transmission in combination with an effective temperature reduction. This combination will ensure more photosynthesis and lower greenhouse temperatures. The incoming light is scattered by the diffuse coating layer, reaching the leaves from top to bottom and from all sides of the crop. This will improve the photosynthesis and transpiration rates of all plant leaves, resulting in better humidity, temperature and CO2 levels inside the greenhouse. It is proven by research that diffuse light in combination with heat reduction has a positive effect on crop production, quality and growth. Compared to Optifuse, this Optifuse IR version reflects heat radiation (NIR) very efficiently while maintaining photosynthetically active radiation (PAR) transmission. PAR is the spectral range of solar radiation from 400 to 700 nanometers that crops use for photosynthesis. NIR is the spectral range of solar radiation from 700 to 2,500 nanometers that is very efficient for generating warmth in the greenhouse. NIR is not used by the crop for photosynthesis. Optifuse IR needs to be diluted with water before spraying it onto the greenhouse. Depending on the method of application, type of greenhouse and climate, more or less water and buckets should be used to achieve the best result. Optifuse IR is best applied by machine to get an even layer for optimum diffusion. See how to use for more detailed information about applications and dosage. Optifuse IR is removed with Topclear whenever necessary. Apply Topclear in the advised amount and dilution maximum three days before considerable rainfall. Topclear is the cleaner used to remove Sudlac coatings Eclipse LD, Transpar, Optifuse and Optifuse IR. By using Topclear, a grower has full control over when the coating is to be removed. Mix Topclear with the necessary amount of clean water. Apply the solution evenly onto a dry greenhouse surface under dry weather conditions and a minimum temperature of 5°C (40°F). Minimal reaction time is 20 minutes before rinsing with water or brushing. Considerable rainfall will wash away the coating. Only apply Topclear if considerable rainfall is expected in the next few days. Removal of Topclear with roof sprinklers is not recommended. 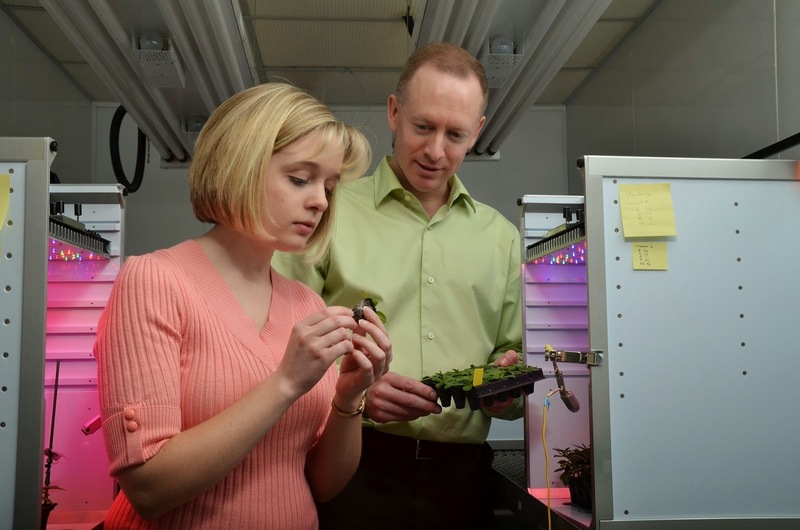 Could LEDs replace plant growth retardants? Researchers at Michigan State University used LED lights to produce compact flower and tomato seedling plugs. Growers and researchers are studying the effects that specific light wavelengths can have on ornamental and edible crops. Research studies are focusing on the effect light wavelengths can have on a variety of plant processes including growth, flowering, fruiting and postharvest quality. Michigan State University horticulture professor Erik Runkle and former graduate student, now floriculture/nursery production extension educator Heidi Wollaeger studied the impact the ratio of red to blue light can have on the production of annual bedding plant seedlings. They looked at the effects of red and blue light on impatiens, petunia, salvia and tomato plugs. blue light can have on bedding plant seedlings. Photos courtesy of Heidi Wollaeger, Mich. St. Univ. Ext. 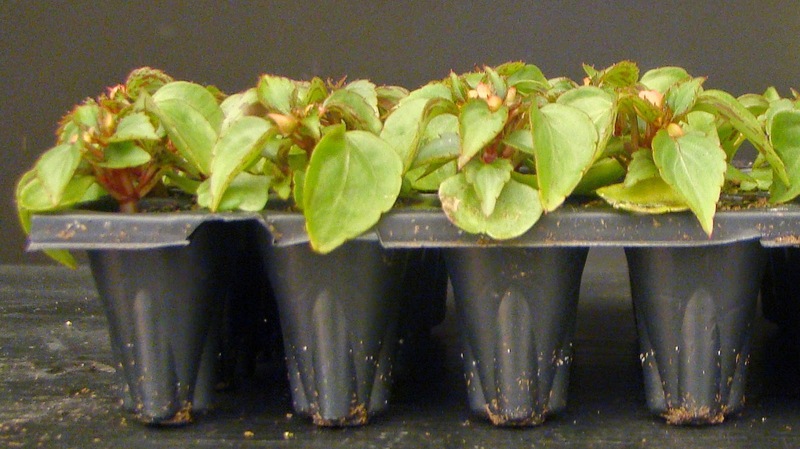 “These four species are very common bedding plants for U.S. growers,” said Wollaeger. “They are key crops for their sales. The tomato plugs were being grown as vegetable transplants and not for production as greenhouse tomatoes for fruiting. Seed was sown into 128-cell plug trays at a commercial propagator and moved into a large growth chamber at the university within two days where LED and fluorescent light treatments began immediately. The plants were Stage 2 plugs when the light treatments began. The seedlings had cotyledons and no true leaves. They were under the light treatments throughout the entire duration of the study. 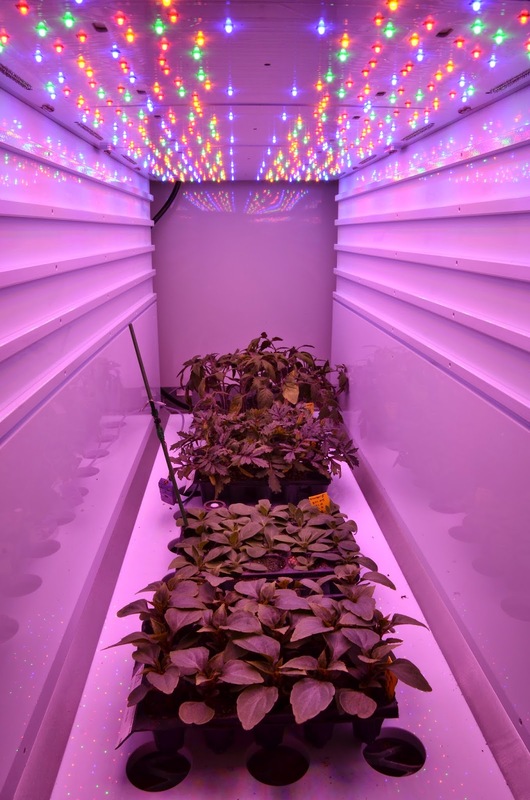 The bedding plant plugs were grown in a growth chamber equipped with six individual LED chambers. The plugs grown under fluorescent lamps were grown in a separate growth chamber. For all light treatments, plants were exposed to 160 micromoles per square meter per second (µmol·m−2·s–1) for 18 hours a day. received LED or fluorescent light treatments. “We chose 10 moles per day because that is a suggested light integral for most plants to be of at least moderate quality,” Wollaeger said. Wollaeger said the study was terminated after four to five weeks because at that time the plants were ready for a commercial grower to transplant. 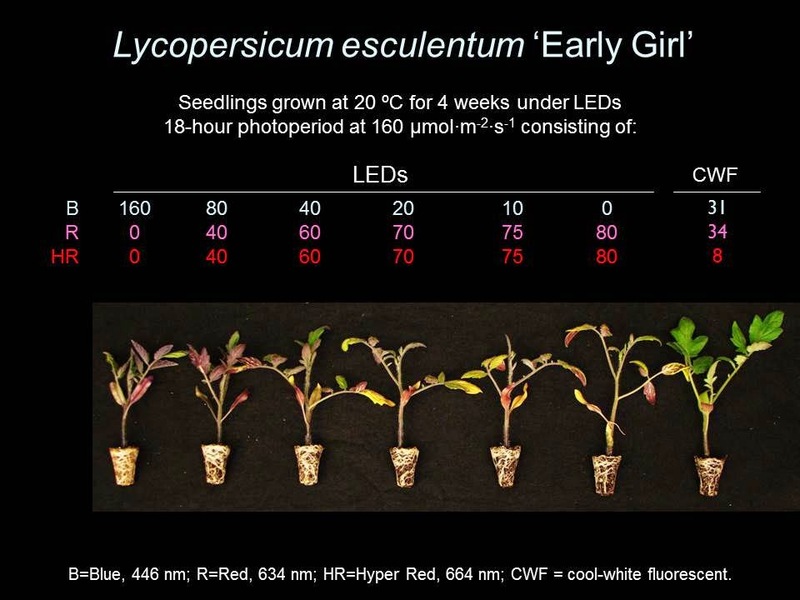 Wollaeger said all of the species grown under the red light dominant background with at least 10 µmol·m−2·s–1 of blue light displayed desirable plant growth responses. a red dominant environment to increase plant quality, which results in compact, well-branched growth. thicker leaves and thicker stems. Plants grown under the fluorescent lamps usually produced the most chlorophyll, but also had the thinnest leaves. Impatiens and salvia had greater fresh shoot weight when exposed to treatments without blue light than with at least 80 µmol·m−2·s–1 of blue light. Impatiens grown under a high proportion of blue light developed more flower buds. Wollaeger said whether this early flowering is a negative or positive effect depends on the plug cell size. plants provided with mostly red light. A benefit of growing tomato plugs under high blue light levels and fluorescent lamps was the reduced incidence of leaf intumescences (sometimes called edema), which are small protrusions that form on leaves, stems and petioles. Wollaeger said this physiological disorder has been associated with a lack of ultraviolet light or blue light. This particular research study did not look at the effects of the light treatments after plants are moved into the greenhouse. Wollaeger said Dr. Runkle’s lab is currently conducting another study to determine the lasting effect of light treatments on transplanted plugs. Not alot of time for a post today, but wanted to put a teaser out there that we are looking at an organic fertilizer that should fit well with Hydroponically Grown Greenhouse Greens, Herbs and Veggies.